A crook with 80 offences on his record went back to crime six months after coming out of jail, a court heard. Wayne Roberts stole a wallet from an unlocked car and used a bank card to buy tobacco, costing the victim £50. He also broke the window of another vehicle, causing £85 damage. 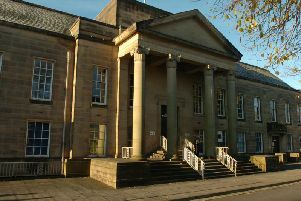 Burnley magistrates were told how the 38-year-old, who had been locked up for burglary, was on licence. Mrs Alex Mann, prosecuting, told the hearing: "He has managed to go six months without going to court, which may not seem a lot, but I think is some achievement." The court heard the defendant wasn't likely to be going out offending at the moment - as he had a broken leg and couldn't get about easily. Mrs Mann said the victim of the theft had parked his car in Nairne Street in the town to help a friend and then popped into a house for a "brew". When he came back out, things in his vehicle had been disturbed and his wallet had gone. Mr Mark Williams, defending, said Roberts had found himself drifting back into drugs. He didn't really remember much about the damage. The defendant had started to come down on methadone perhaps too quickly and started to take illegal drugs. He had been back to Inspire, the treatment service, his methadone had been increased and that was now containing him. The solicitor continued: "He hopes to take up 12 weeks' rehabilitation in four weeks' time. He has to start providing negative samples from street drugs. If he can do, I understand the placement is there and the funding is there. That is what he wants and clearly that is what he needs." Mr Williams added: "He knows if he continues to offend, he is going back in custody. He is less likely to be going out offending when he is struggling to get around." The defendant, of Dalton Street, Burnley, admitted damage on March 22nd and theft. He was given a three-month community order, with a drug rehabilitation requirement and must pay £135 compensation.